Heat the extra-virgin olive oil with a clove of garlic. Once golden, add the organic peeled datterini tomatoes “Gli speciali” Petti drained from their juice. Lower the flame and continue cooking for 5/6 minutes, then add salt and pepper. 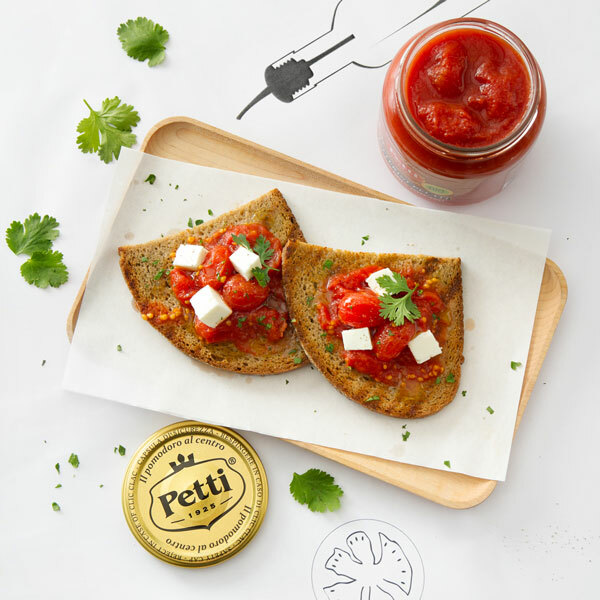 Meanwhile, toast the 4 slices of bread, once baked put the datterini tomatoes on each slice, a few cubes of Greek feta and some fresh parsley leaves. Serve with raw olive oil.